England women's captain Karen Walker has announced her retirement from the international game. 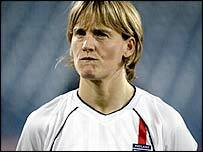 Walker holds the England goalscoring record, notching up 40 goals from her 83 international appearances. She regained her place up front and took over as captain at the start of the 2002-02 season and scored two vital goals in the 2002 World Cup play-off semi-final against Iceland. "I really enjoyed the World Cup qualifiers and I initially felt high on the adrenalin and said I didn't want to retire," she told www.TheFA.com. "But in the weeks after that game, I felt really gutted that we hadn't made it to the World Cup. "The thought about retirement started creeping into my mind and I wondered whether I would make it to Euro 2005. "Without having any competitive games until then, and with the coach obviously wanting to try out new players and new formations in friendlies, I have been finding it hard to motivate myself to train for two hours every day without playing. "My friends, family and several players have gone mad because I am retiring and that is flattering, but after telling (England coach) Hope Powell my decision, I feel as though a weight has been lifted off my shoulders."